The National Waterways Foundation (NWF) has commissioned and released a two-year study to examine the U.S. inland waterways' national economic return on investment and the need for and benefits of an accelerated program of waterways system improvements that sustain and create American jobs. The study, conducted by the University of Tennessee and the University of Kentucky and entitled "Inland Navigation in the United States: An Evaluation of Economic Impacts and the Potential Effects of Infrastructure Investment" (November 2014), evaluates the inland navigation system as it is currently funded and configured, and as it might be through renewed infrastructure investment. The study begins with a basic analytical framework examining navigation's role as a productive input in various industrial processes and reflects actual, real-world economic interactions and consequences if the system were to suddenly shut down and then if proper infrastructure investments were made. Investment in badly needed modernization improvements to our inland waterways' aging lock and dam infrastructure could lead to 350,000 job-years of new, full-time employment with a present value of more than $14 billion over the 10-year period examined in the study. With the loss of waterways' shipping, an estimated 75% of freight would be diverted to truck and/or rail, and there would be a 25% loss due to decreased production. 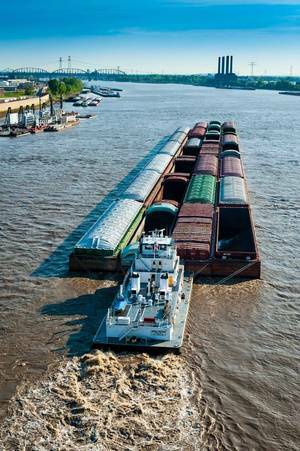 Given that the capacity of just one standard river tow (15 barges) equals 1,050 trucks or 216 rail cars and six locomotives, the nation would face certain traffic gridlock. According to NWF, the United States stands at the brink of a watershed era where transportation planning tools will be even more important. For example, as a direct result of large and unforeseen increases in available and affordable domestic energy resources and other areas of opportunity, there is a growing sense that the U.S. economy can capitalize on increased productivity. But realizing these opportunities requires the nation's transportation sector to adapt accordingly. "The research in this important study sponsored by the National Waterways Foundation is an effort to help develop a more effective framework for policy-makers to understand and measure the current navigation system and look to future possibilities and job creation if proper infrastructure investments are made," said Mark Knoy, National Waterways Foundation Chairman.